One of the characteristics of this Amish novel that I love is the way the author integrates explanations of traditions into the tale. For example, how Amish communities are not all the same, but are unique in many ways. I love how there is a First Christmas then a Second Christmas with each explained and expounded so readers know the meaning of the references. Each person in an Amish community goes through a time where they decide whether to join the church or live in the English world; this period is known as “rumschpringe”. 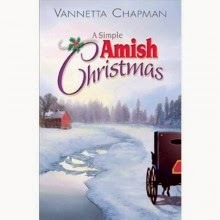 In A Simple Amish Christmas, Annie is sent to live with her English aunt by her parents because she is unsettled with no future plans for marriage. When Annie goes there, she excels more than her parents could imagine, obtaining each goal she sets for herself. When she returns to the community, it is for a family emergency that requires her to come and help tend the sick plus help her mother with her younger siblings. Samuel and Annie are brought together because of the needs of the community, their individual gifts as well as their knowledge that sets them apart from others. However, Samuel has something in his past that he lets prevent him from having any type of future relationship with anyone other than simple friendship. As time goes by, Samuel begins to be convicted about how he has treated God and while looking to reestablish his walk with the Lord, he unpacks his family Bible. When he does so, the Scriptures begin to speak to his heart and the future comes into focus more than ever before. Will Samuel allow faith or defeat to prevail in his decisions about the future? Vannetta Chapman wrote the novel a couple of years ago, but don’t let that deter you from experiencing again the hope that comes with Christmas. The author has written several other novels, a couple of which I have read and enjoyed immensely. I sure hope that many will take time to read this story and share a copy with someone over the coming holidays. My rating is 5 stars. When this blog began it was during a time of raising my sons and care taking for ailing inlaws. Before those seasons ended this blog morphed into writing reviews and interviewing authors. With the constant change in the Christian publishing industry and our society, our purpose expanded. With my girlfriend coming alongside, we review all sorts of novels, hunting for sound stories. While there are a couple genres we will not review for several reasons, we remain open to looking into new opportunities to read and share about good books! In all of what we do we aim to bring glory to God and Christ Jesus in the ministry of blogging which we believe He has blessed us to do. We are always amazed that we get to wake up and do something with such profound joy each and everyday.